Scientists at University of California San Diego say they have developed a new method to determine if bacteria are susceptible to antibiotics within a few hours. They believe this advance that could slow the appearance of drug resistance and allow doctors to more rapidly identify the appropriate treatment for patients with life threatening bacterial infections. In a paper (“Bacterial Cytological Profiling as a Rapid and Accurate Antimicrobial Susceptibility Testing Method for Staphylococcus aureus”) published in EBioMedicine, the team described the rapid susceptibility test for Staphylococcus aureus, a bacterium that causes some 60% of hospital-acquired infections and which has spread in communities, causing pneumonia and a variety of skin and tissue infections in both healthy and immune-compromised individuals. The development is important, say biomedical scientists, because of the critical need for physicians to rapidly discriminate between drug resistant strains (commonly termed “MRSA” for methicillin-resistant S. aureus) and drug sensitive strains, because these infections can progress rapidly, especially MRSA strains with additional resistance to newer antibiotics designed to treat pathogens that are now appearing in hospitals. 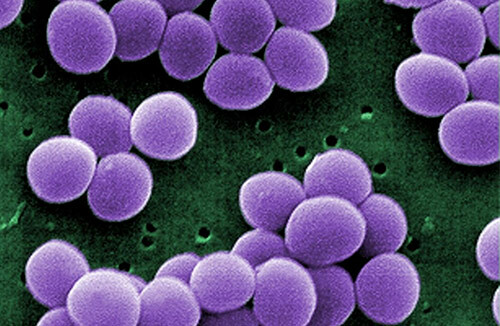 Rapid antimicrobial susceptibility testing allows doctors to discriminate between infections caused by drug sensitive bacteria, which can be treated with safe and effective antibiotics, and those caused by drug resistant bacteria, which might require newer antibiotics, such as daptomycin or cubicin. This approach will decrease the emergence of resistance by reserving the newest drugs for those infections where they are most needed. Examining single cells has two key advantages over other testing methods, say the researchers. First, it is rapid, cutting days off the time for typical culture-based assays. It often takes days for a doctor to receive information on resistance, and this means that patients with life-threatening infections are often treated with the assumption that the infection is drug-resistant. Second, this method does not rely on having any detailed understanding of the bacterium causing the infection, or of the genes that convey resistance. This is particularly important in this case, wherein resistance to the drugs used to treat MRSA infections arises by several evolutionary pathways via different combinations of mutations. It could also provide rapid treatment information for newly emerging bacterial pathogens, such as that which caused the infections transmitted by endoscopes. “Regardless of the type of bacterium, a healthy and growing bacterium looks different from a dead bacterium, so whenever we detect a difference in how the cells look, we know that the bacterium is sensitive to the antibiotic we have applied. When we combine careful culture conditions, cutting edge imaging methods and a detailed quantitative analysis, we can turn this simple approach into a reliable test,” said Joe Pogliano, Ph.D., professor of biology.